We’re spending $833,425 so an acre of Lincoln Park can be paved, even though a measly $500/day rents 100+ parking spots from the DMV across the street. I called Gil Cedillo’s field office in Highland Park last week to find out more about the paving of over an acre of the interior of Lincoln Park for a new, unneeded, $833,425 parking lot for patrons and staff at Plaza de la Raza. I heard back from one of his deputies. His office promises to manage construction in the park so that pedestrians in the area are safe. I imagine their management couldn’t do much worse than letting people drive in through an unpoliced entrance to the interior of a historic park. I guess we’ll see. As to the mechanics of why this parking lot is being built … it is just sort of a shoulder shrug from the authorities. Walking around the park is atrocious – utility poles block access; high-speed arterial street designs make it dangerous; crossing points are few and far between with long delays to wait for signals; curb ramps are in short supply or nonexistent. Within the park, the pavement is gravelly, uneven, broken with gaps that make it unusable for those with not fit and able to jump over cracks. The bathrooms are rarely cleaned. The playground dotted with deferred maintenance, smears of melted ice cream from weekends long past. Concession stands long closed. A pool that has been drained. A carousel sold off for parts. A boathouse shuttered forever. 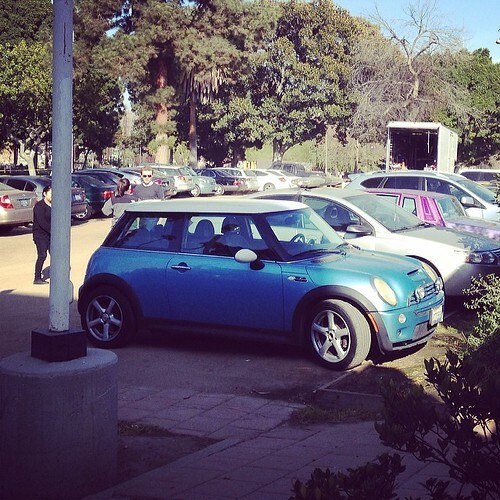 The cost to rent the large paved parking lot across Mission Drive from Plaza de la Raza? A measly $500/day, the addition of the DMV to the Plaza’s liability insurance, and a shifting of the Plaza’s security guard from the illegal parking lot in the park to the DMV’s lot. To spare the Plaza this expenditure of the money the City gives it to fund its operation, the city is going to spend $833,425 paving the park interior to build a parking lot. To save a couple thousand dollars a year in fees (how many special events will they do? 10? 20? ), we’re going to build a parking lot at a cost hundreds of times that amount. We’re going to pave the interior of a historic park … for what? How many dance and music classes does one have to teach before your can drive onto the lawn in the middle of Pershing Square? Can you imagine someone cruising on the paths in Echo Park in their BMW and NOT having hell get raised? Is it acceptable in MacArthur Park for people to drive onto the lawn by the lake, uncontrolled, for free, whenever they want? Is Penmar Park open to drivers in the middle of it? Do people get to park wily nily in Grand Park downtown or drive through the park on Spring and 5th? Where in this city is it okay to pull directly onto pedestrian paths and drive through a park like this? Where would we reward this mismanagement, this law breaking, with $800,000+ in pavement? Lincoln Park, that is where.